Each tab contains 10 mg of Oxandrolone. Protein synthesis disorders, cachexia diverse genesis, trauma, extensive burns after irradiation infectious diseases, muscular dystrophy, osteoporosis, negative nitrogen balance corticosteroid therapy, aplastic anemia and hypo. Hypersensitivity to the drug, prostate cancer, male breast cancer, breast carcinoma in women with hypercalcemia, coronary heart disease, severe atherosclerosis, nephrotic syndrome, acute and chronic liver disease, including alcoholic nephritis, pregnancy, lactation. The best dose associated with Oxandrolone for males is 100 milligrams per day and ladies can expect magnificent results having only 3-10 milligrams daily. Alternatively, since females will be more sensitive to steroid drugs lower doses need to be utilized; more, reduce amounts totally ensure side-effects will continue to be non-existent. Nearly all women will discover 10mg daily being almost perfect. 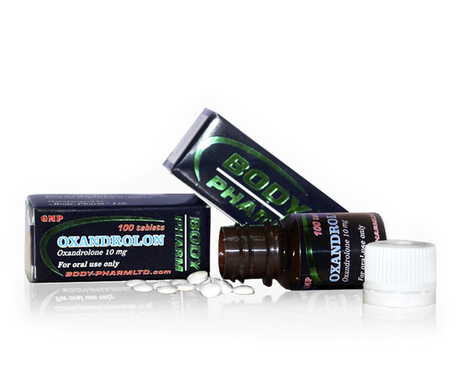 Oxandrolon is an anabolic steroid. Reaching into the cell nucleus, stimulates the genetic apparatus of the cell, leading to increased synthesis of DNA, RNA and structural proteins, active enzymes of tissue respiration chain and enhancing tissue respiration, oxidative phosphorylation, ATP synthesis and intracellular aggregation macroergic . Stimulates anabolic and inhibits catabolic processes those caused by glucocorticoids. It leads to increased muscle mass, reduced fat deposits, improves trophic tissues, promotes calcium deposits in the bones. Exhibit moderate androgenic action. At the first signs of virilization at patients (deepening of the voice, hirsutism, acne, clitoromegaly) the administration should be stopped to avoid irreversible changes. Should be done a systematic control of lipidemia and cholesterol. Pediatric use should be made by an experienced specialist to avoid premature epiphyseal bone calcification. Women - Symptoms of virilization, acne, menstrual disorders. Men: In the prepubertal period - virilization symptoms, acne, withholding or the growth stopping (calcification of epiphyseal growth zones and tubular bones); during postpubertary - gynecomastia, priapism, inhibition of spermatogenesis. In men and women - the progression of atherosclerosis, peripheral edema, impaired liver function, changes in blood count, pain in bones sockets.